EYEcenter Optometric prides itself on staying ahead of the curve. From advanced methods in vision care to the latest technology, we always aim to stay a step ahead. But throughout our nearly 58-year history, EYEcenter has also stayed true to its roots. From keeping the business in the family (founder Dr. Fred Fuerst’s son, Dr. Randy Fuerst, is one of four current partner doctors of EYEcenter) to remaining anchored in our culture– part of which is centered around one of the company’s tenets: to take care of people. Youth charities were a big part of EYEcenter’s focus this year. Last week, we teamed up with VSP and Nordstrom to help local foster teens from Koinonia Homes for Teens in Loomis. 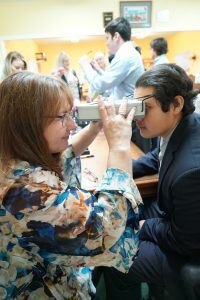 EYEcenter provided vision screenings, eye exams, and eyewear in conjunction with Koinonia’s Dress for Success Style Workshop, where the teens were styled and coached in preparation for job interviews as they leave the foster care system. 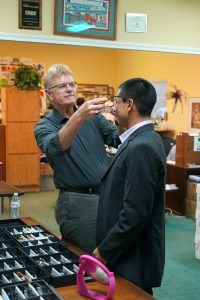 Dr. Lee and his staff joined volunteers from Marchon and Altair at the workshop to style and measure glasses for the teens in need of vision correction. The participants also received personal clothes styling from Nordstrom employees. EYEcenter had brought the teens into our clinics for vision screenings over a few weeks prior to the event. The ones who needed vision correction were then brought back to determine what prescription was needed, and then chose their eyewear the day of the workshop. All frames and services were donated to Koinonia on behalf of the program. EYEcenter was blessed to be part of such an amazing collaboration for a great cause.